Just Policy Blog repost by the Campaign for Youth Justice originally posted on October 10, 2013. 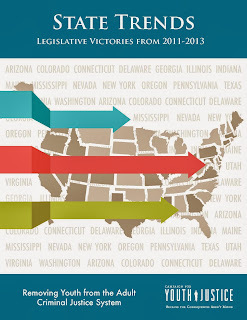 Today the Campaign releases its newest report: State Trends Legislative Victories from2011-2013 Removing Youth from the Adult Criminal Justice System. State Trends documents the achievements of the past eight years in which twenty three states enacted forty pieces of legislation to reduce the prosecution of youth in adult criminal courts and end the placement of youth in adult jails and prisons. October is the perfect month to highlight these state victories by releasing our newest publication during Youth Justice Awareness Month. Trend 1: Eleven states (Colorado, Idaho, Indiana, Maine, Nevada, Hawaii, Virginia, Pennsylvania, Texas, Oregon and Ohio) have passed laws limiting states’ authority to house youth in adult jails and prisons. Trend 2: Four states (Connecticut, Illinois, Mississippi, and Massachusetts) have expanded their juvenile court jurisdiction so that older youth who previously would be automatically tried as adults are not prosecuted in adult criminal court. Trend 3: Twelve states (Arizona, Colorado, Connecticut, Delaware, Illinois, Nevada, Utah, Virginia, Washington, Ohio, Maryland and Nevada) have changed their transfer laws making it more likely that youth will stay in the juvenile justice system. Trend 4: Eight states (California, Colorado, Georgia, Indiana, Texas, Missouri, Ohio, and Washington) have changed their mandatory minimum sentencing laws to take into account the developmental differences between youth and adults, allow for post-sentence review for youth facing juvenile life without parole or other sentencing reform for youth sentenced as adults. The state victories reported are a testament to families, advocates, and youth demanding more from their policy makers, and policy makers demanding more accountability from the state courts and agencies responsible for handling youth justice issues. The last five years demonstrate what is possible when facts and data drive reform rather than eye catching headlines about youth crime. Kids are different and our state policy makers are finally recognizing this, and in turn enacting laws and policies that reflect this. There is still so much more that can be done so please check out local YJAM events in your state by clicking here. Daugherty is policy director for the Campaign for Youth Justice.